International Women’s day is a natural fit to Women’s History Month in the US. 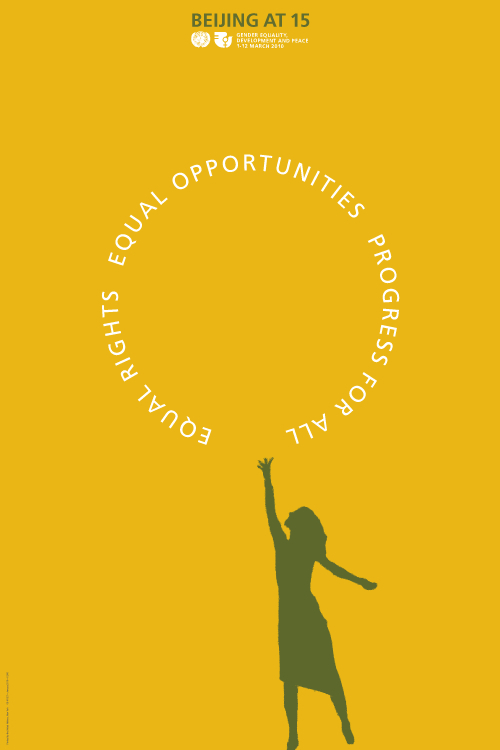 The UN states that March 8th, 2010 “marks the 15th anniversary of the adoption of the Beijing Declaration and Platform for Action, the outcome of the Fourth World Conference on Women in Beijing in 1995.” The theme this year is “Equal Rights, Equal Opportunities: Progress for All”. A history of the day, which the UN traces back to 1909 in the US, as an anniversary to the 1908 NY garment workers strike, can be found at their site HERE. If you are interested, the UN has a long list of documentation regarding their 15 year review and appraisal of women’s and girls progress. It can be found HERE. It seems a lifetime ago that Hillary Rodham Clinton; now, Secretary of State Clinton, with other forward souls, went to Beijing and developed the benchmarks for women’s progress that would take us into this century. It seems three lifetimes ago that a younger naive woman like me assumed that the ERA would pass, and we women would be equal citizens of the United States. I am hopeful still. And determined. And, when the rage strikes me, I remind myself that it is the journey, rather than the goal, that makes us who we are.